My first morning back home, I attend Covenant Presbyterian with my mother. Instead of entering the dark, brick sanctuary and settling into fixed, cushioned pews, we take a right into the fellowship hall and, after the usual proud presentation of Mom’s Son from Massachusetts, settle into a row of folding chairs. This was the room where, back in the ‘60s, I was first called up from the minors of kindergarten to the majors of the adult service. But soon we moved to our imposing new sanctuary, with its heavy brick interior studded with slats of stained glass, heavy cushioned pews anchored beneath steeply pitched ceiling and heavy wood beams, pulpit rising wide and tall next to the altar, beneath a gorgeous stained glass window that showed no particular biblical scene, but instead a more abstract rendering of meditative beauty. Then came April 27, 2011 – the date a tornado with 190 mile per hour winds tore a six-mile long and, at points, mile-wide swath through Tuscaloosa, killing 43 people and demolishing thousands of homes. The Central Church of Christ, just two blocks from here, was leveled outright; we were fortunate to simply lose part of the roof and that magnificent window. Instead, today we have to settle for a poster photo of the window, resting on a portable metal tripod. The altar is a folding table covered by white cloth, the clay jar and bowl for communion sits on a portable wood pedestal, beneath a short silver cross. It’s going to be a long time, maybe a year, before this congregation knows anything different. But just as the sadness settles into me, a slender woman with short bright red hair enters the side door and smiles in surprise. It seems the very opposite of irreverent to rise, step across the aisle and give her a hug. Dusti is, after all, a big reason I’m here today – if only because of wheels she set in motion 30 years ago this spring, in the offices of this church. Back in the spring of 1981, I was finishing my degree at the University of Alabama. With a journalism major – and several years of near full-time sports-writing under my belt – I looked to be following in the footsteps of my journalist father. But I’d also chosen to minor in English and, of all things, Religious Studies. So I was understandably confused – and convinced that what I needed was to buy some time just hanging around the college town, without having to dive back into newspapers until I knew it was what I wanted. So one afternoon I dropped into Dusti’s office, looking for answers. Then, that night, the phone rang. It was Dusti, calling to tell me that June had decided not to pursue Tithe of Life. I felt flattered that Dusti would call and tell me this, but then I realized why. “I’m wondering if you would be interested in taking her place,” Dusti said, and proceeded to sell me on the idea. It would be the best of both worlds, her argument went. I needed to get away from the hometown, and this way I would do it with a support system, given the camaraderie I would have with the other Tithe of Life interns. And while my love of writing had drawn me toward newspapers, my religious studies minor suggested other paths that needed to be explored. I had walked into Dusti’s door that afternoon wanting her to tell me how I could hang around the campus for another year or so; by the time I hung up the phone, she’d pretty much talked me into joining a program that would ultimately turn me into a temporary Texan. That story is ironic enough to satisfy on its own terms, but as always with our lives, one story folds into another, larger one. In my case, Dusti had identified in me a general restlessness – an insistence for my life to mean something more than just making a buck or even excelling as a writer – and showed me one mold into which I could pour that desire – one of service. 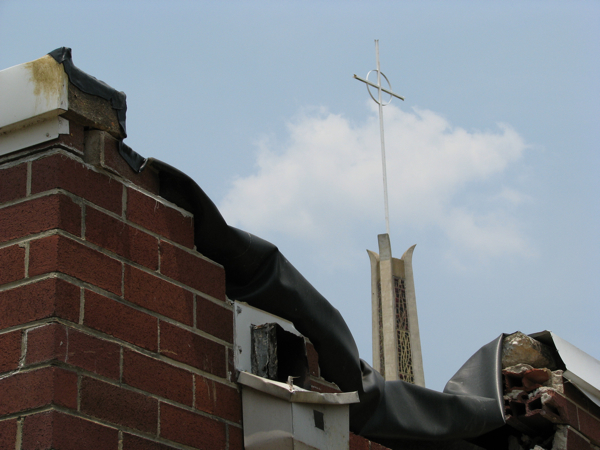 I’m back at Covenant Presbyterian on this day, in June of 2011, because I’ve come home to do a few days of tornado debris removal in the very neighborhoods I probably cut through three decades back on that fateful drive to Dusti’s office. Not only that, but even though I live more than 12 hundred miles away in the Northeast, the land of snow and ice and a certain brusqueness when compared to the South, my life there is what sends me here – for it would be hypocritical for the director of Assumption College’s community service learning program, a position I was given after decades of using community service in my courses at both Assumption, not to come home to serve his hometown in its greatest hour of need. This, and many other stories – some sad, some funny, some a little of both – Dusti and I revel in today after church, before Mom and I drive over to the disaster relief center where I’ll start my tornado relief work.